To truly enjoy any wine, it is well known that it needs to open up and breathe. However, this process can take up to 1-2 hours to fully open up when poured into a typical wine decanter. Pique Lifestyle has quickened this process to allow you to enjoy great wine instantly without sacrificing quality or taste! This is elegance redefined. Say GOODBYE to the hours of waiting for your wine to open up and breathe. Say goodbye to spills and wine overflows from hand-held aerators and decanters. Say HELLO to Pique Lifestyle's drip-free easy to use aerating pourer! Instantly inject oxygen into your wine to turn it into noticeably smoother, aroma-filled taste! Our friction-fitted rubber stopper is designed to fit to all sizes of wine bottlenecks. This prevents spills and overflows during pouring, keeping your tablecloths white! The Pique Lifestyle Aerator Pourer allows you to enjoy the TRUE taste of your wine with every glass! Our unique air injection system INSTANTLY infuses oxygen into your wine as it pours through our ergonomically designed spout. Witness this amazing effect with the collection of bubbles as it instantly works while you pour. We are CONFIDENT that you will fall in love with our Aerator just as we and many others have as well! The sharp and eloquent design will instantly impress your friends and family and is a GREAT gift and housewarming idea! Our high quality Pique Lifestyle Aerator is covered under a LIFETIME MONEY BACK GUARANTEE. If you are not 100% completely satisfied with your aerator we will ensure a quick and hassle-free refund. Ready to start instantly enjoying your wines? Then click “Add to Cart” and add as many wine aerating spouts as you would like!  QUICK DECANTING TO IMPROVE TASTE; Our red wine aerator instantly opens your wine to a silky and noticeably delicious smooth taste! 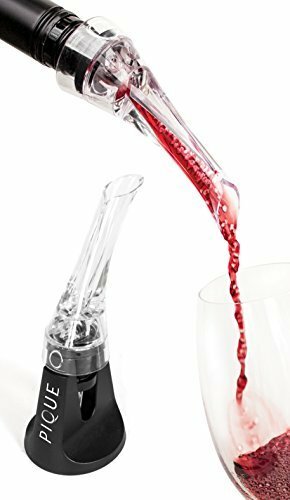 The Pique Lifestyle Wine Aerator Pourer has a unique air injection system that harnesses the Bernouli Effect to instantly pump oxygen into your wine as it pours through our ergonomically designed spout. Leaving you with a luxurious glass of wine with intensified aromas and taste which would usually take hours with a common wine aerator decanter carafe!  DRIP-FREE and EASY TO USE; Our uniquely designed rubber stopper is designed to be friction-fitted precisely to all sizes of wine bottlenecks. This prevents spills and overflows during pouring. Our aerator can easily be cleaned by gently disassembling the spout from the base and running it under water after use.  ELEGANCE REDEFINED; Our unique and beautifully crafted Pique Lifestyle Aerator Pourers, are only created from top quality FDA approved acrylic products. Our ergonomic and easy to use designed pourers are the ultimate gift for any level of wine lover.  PERFECT GIFT IDEA FOR ALL OCCASIONS; Great for housewarmings, parties, holidays, birthdays, anniversaries, wine tastings, or something to surprise that special someone you know appreciates great tasting wine. ✓ FULL LIFETIME WARRANTY GUARANTEE - Our high quality Pique Lifestyle Aerator is covered under our manufacturer lifetime money back guarantee. If you are not 100% completely satisfied with your aerator we will ensure a quick and hassle-free refund. The Pique Lifestyle Aerator Pourer is on sale for a limited time only! Ready to start instantly enjoying your wines with our great Pique Lifestyle Wine Aerator Pourer? Then click the "Add to Cart" at the top to order your aerator today! If you have any questions about this product by Pique Lifestyle Inc., contact us by completing and submitting the form below. If you are looking for a specif part number, please include it with your message.